The Texas Brown Snake is a very common snake found throughout Harris County, and is highly variable in color, ranging from browns to tans and even brick reds. The color of Texas Brown Snakes is fairly even, though, with the exception of a faint lighter stripe down the middle of the back. Additionally, the top of the head and the corners of the mouth are darker in color. These dark 'spots' on the sides of the head can resemble large eyes when the head is flattened out. 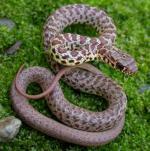 This makes these small harmless snakes seem larger and more dangerous than they really are, since hatchlings are the size of an earthworm, and even adults are no more than 13 inches long. 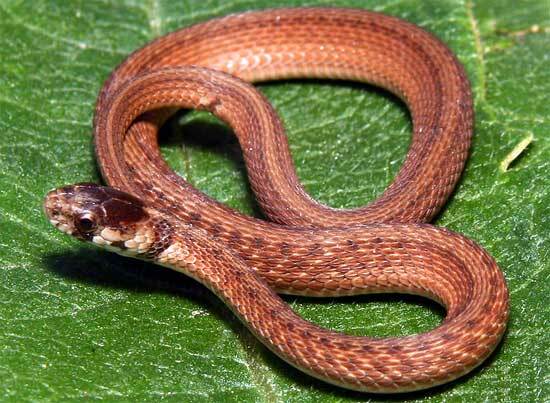 Texas Brown Snakes are completely harmless if encountered, but will readily feign aggressiveness to defend themselves. This usually involves coiling up, raising the head, striking out repeatedly at anything that gets too close and vibrating the tail. This is just an act to get larger animals to leave them alone, however, since they generally strike with their mouths closed, and their mouths aren't large enough to grab human skin even if they tried! Texas Brown Snakes can be found just about anywhere there is a cool dark moist bit of soil - like nicely mulched landscaping - which is why they are so commonly seen. In a one hour survey, the author personally observed 47 Texas Brown Snakes of varying colors in one four foot by eight foot area covered with brush alongside a residence. Needless to say, the owner of the house had been complaining of seeing "all kinds of baby copperheads" in this brush pile. Imagine his surprise to find out these were not only harmless but full grown! Texas Brown Snakes eat a wide variety of suitably sized insects and other invertebrates, including snails and slugs, making them a gardener's friend. After all, you decide what's better - slugs or brown snakes!